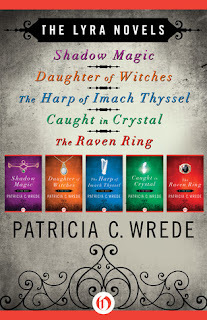 I just finished this series of 5 books, which came all in one set for Kindle, under the title The Lyra Novels. While they are set in the same world, there aren't any overlapping characters and the books can be read in any order. Of course, certain types of people and places play central roles in some books and more peripheral roles in the others. One recurring theme throughout the series is the idea of powerful magical objects that have fallen into the hands of somewhat ordinary people. The object must then be protected and saved from those determined to get it, who are usually much more experienced and also evil. 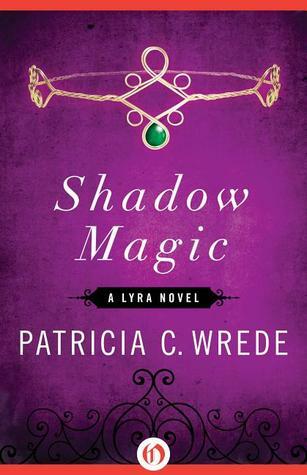 Shadow Magic was Wrede's first published book. As I have only read her later work up until now, it was enjoyable to see her early efforts and appreciate her growth as a writer. In fact, at the beginning of the series, she talks about the experience of re-writing Shadow Magic several years later, with examples of changes she made. It was fascinating. This was the rewritten version, by the way. Even though I didn't find any that I loved, I'm glad I read them. They're written for adults, but teens would probably like them, too. If you just want to read one, pick up #5: The Raven Ring. My second favorite would be Shadow Magic. 3 stars: What legends are made of. There has been some trouble lately with caravans disappearing and attacks from Lithmern increasing, and the Lord of Brenn is quite concerned. It all hits home, though, when his daughter Alethia is kidnapped. Among those who set off to find her are her brother Har and is friend Maurin. 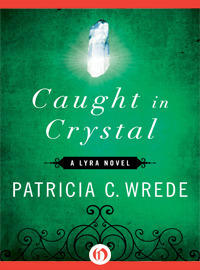 In the process, they all uncover a problem that is much deeper and more dangerous than anyone could have guessed. The Lithmern have awakened an ancient power and plan to use it against Alkyra. If the noblemen of Alkyra can't stop squabbling long enough to even muster a defense, it will mean the complete downfall of the kingdom. Alliances must be made--quickly---amongst the non-human people of the land, as well. It will take everyone working together to defeat the darkness threatening to engulf the land, with Alethia playing a bigger role than anyone could have guessed. A good mix here of politics, race relations, and magic. A light touch with the romance, which is how I like it. An enjoyable, quick read. Content: Battle scenes with some blood and death, but nothing too graphic. Otherwise clean. 3 stars: A glimpse into a Lyran dystopian society. This one probably had the most connections to other stories. Rinara is an indentured servant to an abusive innkeeper. Her city, Drinn, is not a safe place for anyone to be, though. The Priests of the Temple rule the citizens with an iron hand and have eyes everywhere, it seems, particularly during the Midwinter Festival. Magic or being a witch is one of the worst offenses a person can be accused of and usually results in a fiery death for the accused. 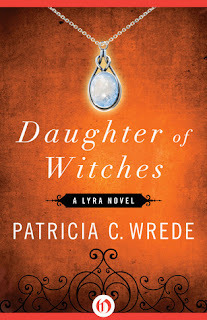 In fact, Rinara's own parents were burned for being witches, leaving her this wretched life she lives now. When 3 guests--strangers and outsiders--book a room at the inn during the Midwinter Festival, Rinara knows there will be trouble. The city is closed to outsiders during that time, and the closure is strictly enforced. What Rinara doesn't realize is how her fate will be bound up closely with theirs, and what she will discover about herself in the process. Assuming any of them survive, of course. Characters I cared about, with a side of interesting world-building. Rinara's awakening to her own abilities, and to the reality that life could be different from her narrow experience was satisfying. I had hopes that the plot would move beyond the "on the run" section, but alas, that's where it stayed for a very long time. Not my favorite, but I guess it worked for us to get know all our characters quite well. There were a few minor inconsistencies, but nothing big enough to really bother me. Content: Some innuendo, as one of the Priests has turned his lecherous intentions toward Rinara. 2 stars: Fine, but not particularly memorable. 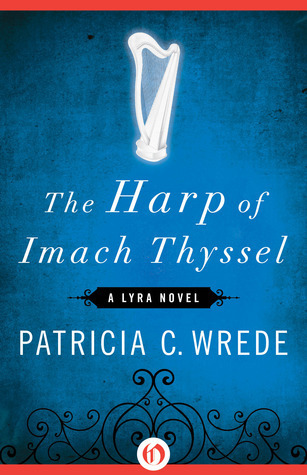 Emereck and Flindaran are off a lark together when they stumble upon an ancient castle and its even more ancient magical artifact: the Harp of Imach Thyssel. Emereck is just out of minstrel training, so he immediately takes to the Harp, though he can sense that it has powers beyond what he can or should be involved with. He decides the Harp must be taken to his masters back at the Guild, to be studied or destroyed, as they see fit. Unfortunately, life has other plans. Once they get to Flindaran's house, leaving with the Harp will not be so easy as it appears. The Harp has power that is hard to resist, but it tends to leave sorrow in its wake. Emereck will find himself tested beyond what he thought possible, as sorcerers of all stripes descend upon him in search of the power of that he holds. When I was thinking back on the series as a whole, it took me awhile to remember what this one was even about. So that's not a great sign! Also, Emereck and his love interest--what's-her-name--(no really, I can't remember it), had this very different relationship going on. He basically chose to be moody and rude a lot of the time--mostly because he was trying to scare her off for her own protection or something--while she somehow saw through all of that and didn't let any of it faze her. She stuck to him like glue no matter what he dished out. Seriously, what did she see in him? In real life that would get old very fast, I would think, romantic ballads or no. 2.5 stars: 80% talking and flashbacks, 20% action. Maybe 90/10. Kayl is an innkeeper in a very small village, raising her two children alone after the death of her husband who was a Varnan wizard. The two met on an ill-fated expedition to the Twisted Tower many years ago, when Kayl was still a member of the Sisterhood--a group of women with access to great magical power of various forms. She hasn't even looked at her sword in many years. In fact, she has successfully blocked out most of her memories from that time in her life. Then a visitor named Corrana arrives at Kayl's inn. Corrana is an Elder Sister--as Kayl later finds out--and in fact, has come to recruit Kayl for another mission: a return to the Twisted Tower. Kayl's group is the only one that has ever successfully breached the spells on the door--at great cost to themselves--and the magical power of the Sisterhood has been waning for many years now. They think it must have something to do with what happened in the Tower so many years ago. They are desperate to get back inside and remedy the problem. Soon afterword, an old friend shows up at the inn: the other wizard that came on the expedition way back when. He's a wanderer and sees troubling visions. In fact, he has seen one pertaining to Kayl, her children, and the inn. While not all of his visions come true, he is certain enough that this one will, that they all flee the inn: Kayl, her children, Glyndon (the wizard), and Corrana. Eventually, they end up in Kith Anuel, the home of the Sisterhood, where Kayl will have decide how much of her past she is willing to let back into her life again. This one got off to a strong start with the forced desertion of the inn, but then about the time they left for Kith Anuel, it hit an extended slow stretch. Most of the time travelling to Kith Anuel--6 months covered in a few pages--and the time within the city itself was made up of people talking at each other and Kayl remembering the original Tower trip and its aftermath. There were a few exciting moments, but they didn't last very long, before we were back to more discussions. Yawn. The ending picked back up again finally, but not enough to redeem the middle. I will say, the kids added some good distractions and gave Kayl's character quite a bit more depth. As for the romance, I could see it coming, even though there didn't seem to be many outward signs of the two falling in love. I felt like I wasn't surprised because I was told not to be, not because I saw it happening for myself. A step above the Harp of Imach Thyssel, but not a big step. 3.5 stars: Good balance of action, quirky characters, and a little bit of romance. Eleret is a warrior, trained in the ancient ways of her people, the Cilhar. Her Ma was killed in battle and Eleret takes it upon herself to travel to the city Ciaron, to pick up her mother's things in person. It's a good thing she does, too. There have been some incidents relating to her mother's kit--attempts to steal it--that has the Commander thinking there must be something unusual or important inside. The only thing Eleret finds that would even be worth stealing is a silver ring with a raven on it that is a family heirloom. 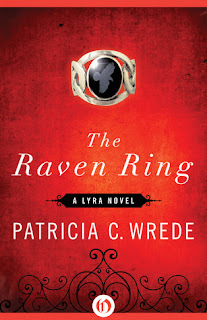 Despite feeling completely out of place in the city, her plans to return home keep getting delayed, as more and more people seem to think the ring is not only worth stealing--it is worth killing for. Killing her, to be specific. In her short time in the city she has managed to find a handful of allies, which is good, because she'll need all the help she can get. Not that she isn't completely capable of winning a fight, but some fights take more than physical prowess--particularly in this strange new world of politics and intrigue that is the city. Who--or what--wants the ring so badly, and why? Of the 5, this was probably my favorite. I was glad to enter the mind of a Cilhar warrior, after being introduced to them in Daughter of Witches. Plus, Eleret was down-to-earth and smart. It was enjoyable to see the way she stayed true to her heritage, but still managed to beat some of the city girls at their own game--when she wasn't fighting assassins and such, that is. I also appreciated the faster-moving plot, as compared to some of the others. The chapter all about the card reading got a bit slow, particularly as it got into multiple explanations of what each card could mean, but other than that the pacing kept me engaged. Content: Some fight scenes, including injuries and death. Otherwise clean. What series has caught your fancy lately? Any others by Wrede that I should be sure to check out?